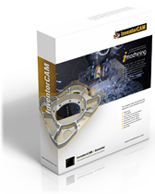 InventorCAM is the best solution for manufacturing inside of Autodesk® Inventor™. Now, iMachining in InvenotrCAM can cut your machining times by 70%! InventorCAM is completely integrated inside today’s leading CAD solution, Autodesk Inventor. Due to its integration, all machining strategies are defined without ever leaving the CAD environment. When using InventorCAM, there is no loss of data or other problems with translation that tend to plague stand alone CAM software packages. Because InventorCAM is truly associative, changes to the design are automatically updated through to the tool path. InventorCAM is proven technology from a company that has been in the business for 28 years. If you’re interested in viewing a software demonstration of InventorCAM, please contact our sales team. Applied Engineering is happy to schedule a face-to-face or web demonstration at a time that is convenient for you. Contact Applied Engineering if you’re interested in purchasing InventorCAM. An Applied Engineering technology sales consultant can normally deliver a quote to you within hours. Applied Engineering is authorized to sell InventorCAM products through its offices in Minnesota, North Dakota, South Dakota, Wisconsin and Northern Iowa. If you’re looking for more information about InventorCAM, you can download an overview or features brochure.